There’s a dead body in the first class compartment of an airliner, and no one seems to have noticed how the passenger was murdered… That’s the set-up for this clever little conundrum, a short story which takes around a half hour to devour. 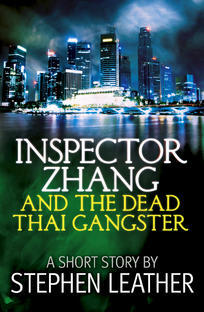 ‘Inspector Zhang And The Dead Thai Gangster’ features Stephen Leather’s regular detective, Inspector Zhang, somewhat out of his normal Singaporean situation on a business trip to Thailand. Zhang has a fascination with the exploits of olde worlde English detectives, so it’s no great surprise when his air flight turns into a traditional locked-room mystery… except the locked room in this detective story is a jumbo jet. Zhang and his sidekick, Sergeant Lee, are up against a ticking clock as they attempt to solve the mystery, reveal the perpetrator and thus avoid possible political repercussions (not to mention a planeful of angry passengers). In the sublime style of Sherlock Holmes or Hercule Poirot, Zhang asks all the right questions, inspects the scene, and comes up with the culprit. The solution to the puzzle is entirely logical and you might be able to deduce it yourself, unlike some convoluted murder tales where the reader doesn’t stand a chance of figuring out how someone dunnit. This is a nifty little mystery which incorporates echoes of earlier detectives – but I can’t say more without giving anything away! Leather’s writing style is concise and easily accessible. The result is an pleasing brain-teaser, deftly delivered. I came across this tale in an anthology of Bangkok Noir, where to be honest it doesn’t quite fit the genre. It’s much more of an Agatha Christie investigation rather than a doom-laden everybody-dies misi-mystery. Great entertainment for a rapid read. This short story is available to download from Amazon.